EdjeTech’s T.O.S,S. extends the life of your metalworking and metal forming fluids and detergent wash waters. 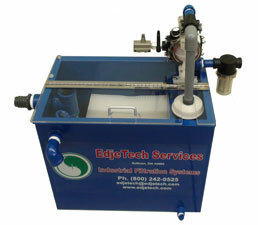 EdjeTech’s oil water separator system (T.O.S.S. T1) is an economical solution to eliminate tramp oil problems. Tramp Oil Separator Systems (T.O.S.S): This easy-to-use and easy-to-maintain system extends the life of your metalworking and metal forming fluids and detergent wash waters. When you use this highly efficient system, you can expect 99% oil water separation efficiency of 20-micron oil droplets and larger on the first pass. Please click on any of our products to read more, or speak with an EdjeTech Services representative directly to learn how our water oil separator systems can meet your specific requirements. Call us today at (800) 242-0525. At EdjeTech, we design our oil and water separator systems to improve process efficiencies, and help enterprises save thousands of dollars that would otherwise have been spent on waste disposal and maintenance. As oil-and-chemical costs continue to rise, it has become imperative for industries to lengthen fluid life, and re-use fluids in every possible way. 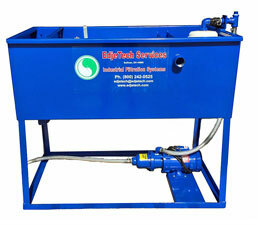 EdjeTech’s innovative separation systems make this possible quickly, and efficiently. Consider our products as a one-time investment that will offer you benefits for a lifetime. Precisely manufactured, and rigorously field tested for over 30 years, EdjeTech’s oil/water separation systems are the smartest way to reduce waste and increase profits. These are two benefits virtually every business desires to obtain.